How does that old saying go? There’s a time and a place for everything? Something like that anyways and in Extermination it’s time for the original five X-Men who were dragged into the twenty first century by Beast to go back to their proper time and place. Because, according to Cable, if they don’t, there won’t be a future for any X-Men as every single mutant in existence will be wiped out in a devastating war. It doesn’t matter how much stock, or trust, anyone usually places in whatever Cable says, this time he’s right and from the first panel on the first page, the race is on to return the X-Men to where they belong before an old enemy can remove them from the board entirely and instigate his dream of mutant genocide. 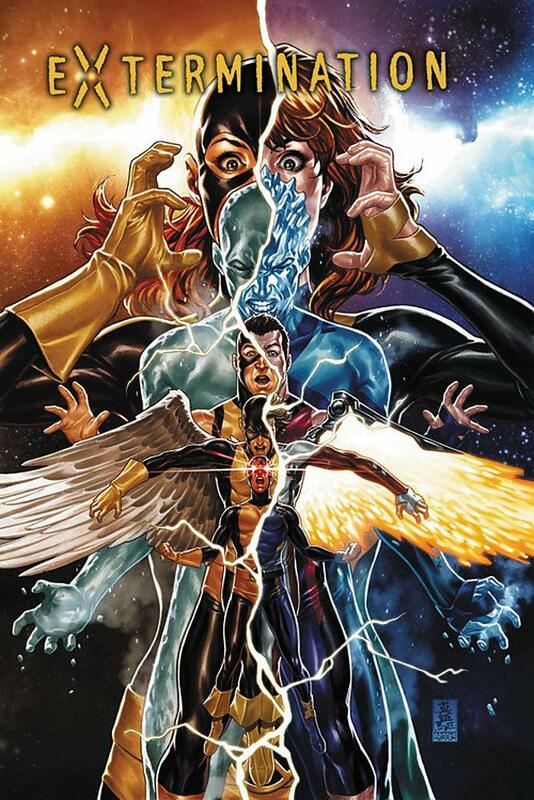 With mutantkind’s existence at stake, the X-Men are thrust into a war of attrition that’s waged between a “hero” who wants to save them no matter what it costs him and those around him and a villain who wants nothing more than to see every single mutant burn in the fires of conflict. Extermination is one of those comic events that you have to strap yourself in and hold on tight for, because a lot, and when I say a lot I mean a LOT, happens in a relatively short amount of time. People die, the whole dynamic of the team radically changes and as soon as you think you’ve grasped what’s going on, Ed Brisson throws a curveball your way, ups the ante even further and flips the plot upside down. Taking its cue from a multitude of genre thrillers, Extermination plays the “all-hope-is-lost” card before finding that one elusive hand that not only promises, but also delivers, salvation in the final act. Meaning of course that it’s an action filled tale that relies heavily on the artistic talents of Pepe Larraz, Ario Anindito and Oscar Bazaldua to deliver said action, which they do in grand, and beautifully detailed, style. Talking about action*, as so much of it fills every page of Extermination, you’d be forgiven for thinking the sheer volume of superheroic mayhem would leave little room for characterisation and good old fashioned story-telling, but you’d be wrong.